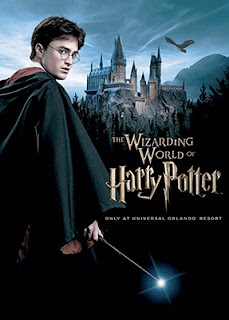 Cindy Gordon, VP of new media and marketing partnerships at Universal Orlando Resort, wanted to publicise the new Wizarding World of Harry Potter attraction, in 2007. "Gordon and her counterpart at Warner Bros. chose to launch The Wizarding World of Harry Potter by first telling the exciting news to a very small group of rabid fans. Seven people at the top Harry Potter fan sites, such as Mugglenet , were hand-selected by Gordon’s team, with Warner Bros. and Rowling herself providing input about the choices. These seven (affectionately referred to by Gordon’s team as “the AP of the HP world”) were invited to participate in a top-secret Webcast held at midnight on May 31, 2007. The Webcast was hosted by Scott Trowbridge, vice president of Universal Creative, and featured Stuart Craig, the academy award-winning production designer for all the Harry Potter films. In the Webcast, live from the “Dumbledore’s Office” set at Leavesden Studios, Craig discussed how his team of twenty designers is bringing together The Wizarding World of Harry Potter theme park. “If we hadn’t gone to fans first, there could have been a backlash,” Gordon says. She imagined the disappointment dedicated Harry Potter fans might feel if they learned about Universal Orlando’s plans in, say, The New York Times rather than an insider fan site. Soon after the Webcast, the team sent an e-announcement to their in-house, opt-in email list of park guests so they could hear the news directly too. Team members also sent the e-announcement to friends and family. During the secret Webcast, a Web micro-site went live to provide a place for bloggers and the media to link to for information on the theme park, which is slated to open in late 2009 or early 2010. Visitors to the site learned that the park will feature immersive rides and interactive attractions, as well as experiential shops and restaurants that will enable guests to sample fare from the wizarding world’s best known establishments. Because Gordon’s team launched The Wizarding World of Harry Potter through social media—putting fans first—they were able to run the entire promotion in-house, with a very small marketing budget (covering the Webcast infrastructure and the micro-site production) and a tiny development team. They did not hire an agency, and they did no widespread outbound media relations, no marketing stunts, no CEO conference call, and no expensive advertising. Of course, not all companies have Harry Potter on their team. But Gordon still accomplished a remarkable feat with an approach that most large organizations would not have taken. She told just seven people, and the power of word-of-mouse led to 350 million people hearing the news." Whoops! Thanks for pointing that out. I've corrected it now.